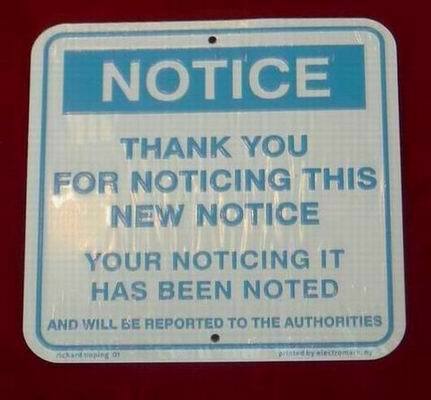 unfortunately I am not richard tipping, and I doubt richard tipping passes by this establishment, but if he does, I shall gladly pass on to him your notification regarding your noticing this notice about noticing a notice. Oh, and please notify mr. hager of my kindest regards, and my sincere hopes of seeing him soonish in Vienna. As you are indeed passing through these premises, Mr. Tipping, I can now proceed as announced here and inform you that Ms. Chantal Labinski noticed your notice about noticing a notice. Come to think of it, this act of notification now can probably really count as "reporting it to authorities", you being the main authority in matters of notification.